﻿ Adamo Hotel, Da Nang | FROM $42 - SAVE ON AGODA! "Property has awesome views of the ocean ." Have a question for Adamo Hotel? "Hotel has a wide selection of buffet breakfasts." "The staff are courteous & thoughtful." 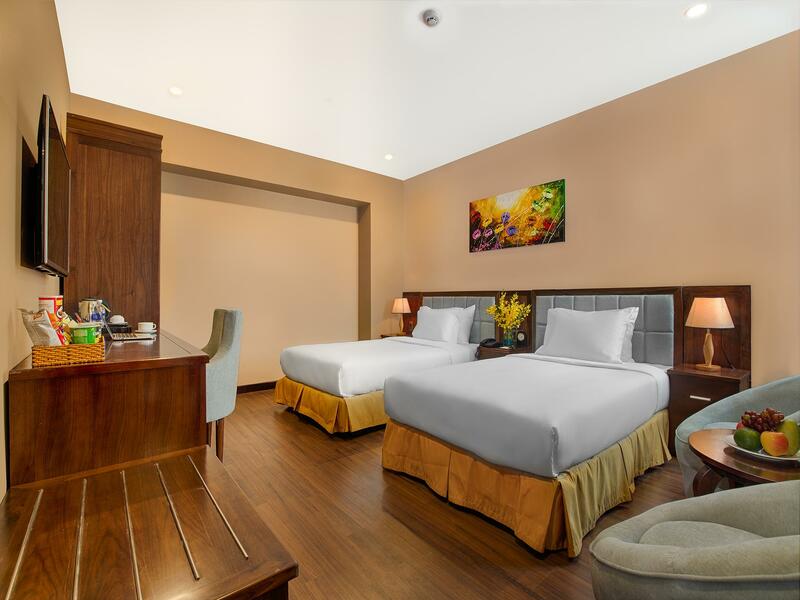 Adamo Hotel, located in the Phuoc My area, is a popular choice for travelers. From here, guests can make the most of all that the lively city has to offer. With its convenient location, the property offers easy access to the city's must-see destinations. 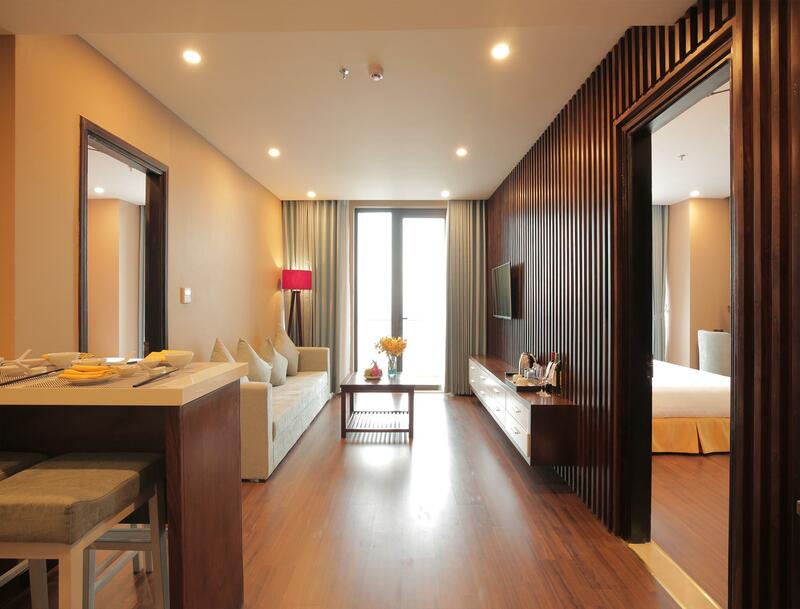 Adamo Hotel offers many facilities to enrich your stay in Da Nang. 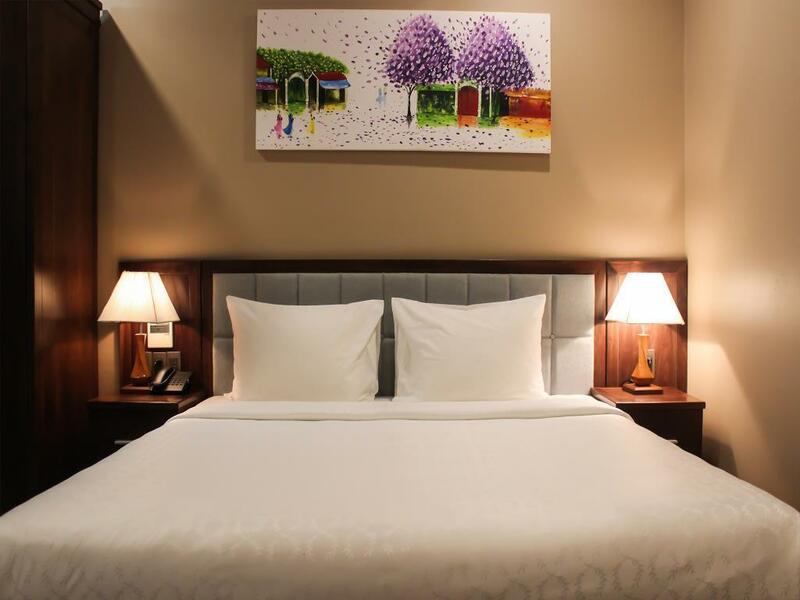 The property provides free Wi-Fi in all rooms, daily housekeeping, gift/souvenir shop, taxi service, 24-hour front desk to ensure the greatest comfort. The property features 106 beautifully appointed guestrooms, many of which include complimentary tea, free welcome drink, mirror, slippers, sofa. The property's recreational facilities, which include fitness center, sauna, spa, massage, steamroom are designed for escape and relaxation. 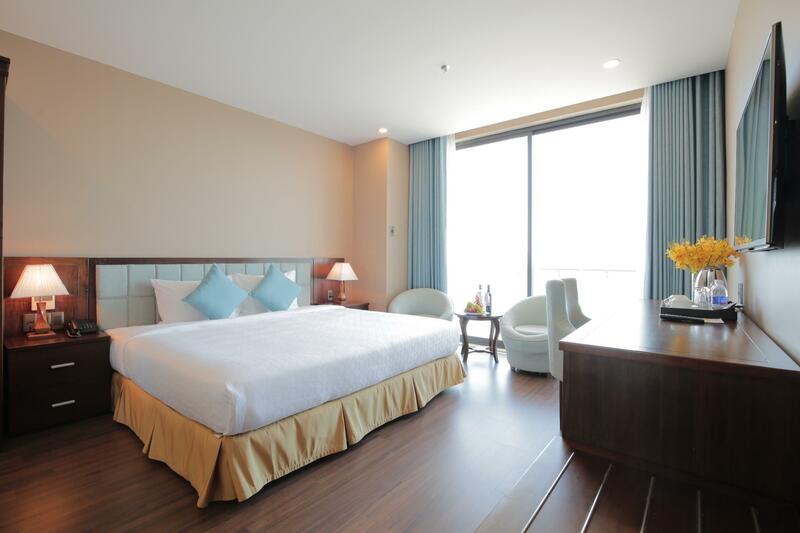 Whatever your purpose of visit, Adamo Hotel is an excellent choice for your stay in Da Nang. "Good location close to beach." Good location where I can reach to the beach in 1 min. The breaksfast is served well with both typical Vietnamese and Western food WiFi’s good Staffs are friendly and supportive We had a seaview where we stay which make our experience even greater Highly recommended! Adamo Hotel is located in front of beach and walking distance for foods and convenient store. Front desk during my check in not too friendly (only that particular staff on duty) otherwise the rest of them are very helpful. Room is clean but don’t expect they make up your room everyday as throughout my stay for 4 days only 1 day they clean up my room, that day was requested by me. Disappointed no refills of shower gel and etc. As it’s insufficient for my family. I urge you to use grab Apps to book your transport, one night we have the taxi from the hotel took us to a restaurant which is not what we want, when we questioned Driver, he said the restaurant is closed for Chinese New Year, we were curious and called the restaurant but they open, then we have to get another taxi to go the restaurant we wanted. The hotel is well presented although the foyer is too spacious, a lot of wasted space. The staff are courteous & thoughtful. The room itself was good, the bed was ridiculously big! I suggest putting a rail waist-high on the window, some guests may feel a little uneasy with the window down the floor level. One strange thing, my room had a bath which was great but NO tap!! It had two showers, so I had to fill the bath with the drench shower & it did not have a shower curtain. Steps from the beach. A little loud with nightlife, but that’s hard to avoid in a city. Get an ocean view room- it’s worth it. Staff helpful. Breakfast decent. Wish I had stayed there longer, would love to return. Oh no... I don't recommend this dirty hotel,, sorry. From Da Nang Airport to the hotel, I chose to take MAILINH taxi. The journey takes about 15 minutes and costs VND130.000. Upon arrival at the hotel, my room type is Superior Triple. Room without window, space is small, so ask for charging room type, because we will stay for 7 nights. The front desk staff Amelia explained to me very carefully about Deluxe and Premium room types. She personally showed me the Premium room 1202, which is spacious, two floor-to-ceiling windows, a sea-facing balcony and an extra bed. It feels really unbelievable. Next day, we arranged with Jenny a seven seater car at the Tour desk. The itinerary is Mable Mountain, My Son and Hoi An. For an eight-hour trip, cost VND1850.000. The hotel driver made me feel comfortable, no speeding and driving smoothly. We have a pleasant journey. Hotel has a wide selection of buffet breakfasts. The 18th floor bar offers beautiful night views and pool. Definitely will stay in Adamo hotel again ! Thank you so much Adamo ! We celebrate our 2nd Anniversary there. And unexpected we got upgraded room to a beautiful sea view with balcony. They even decorate our room with beautiful roses on the bed and in the bathtub. We really impressed and appreciate it. The hotel just faced to the beach, we enjoyed seeing sunrise in our room. The top roof swimming pool with amazing sea view. The staff very friendly and helpful especially Alex and Emily. Staff here can speak very good English. Breakfast was great too. We definitely be back. Highly recommended. Relatively nice hotel flanked by run down buildings besides. Good view of the sea (on one side of hotel only). Rather far off from key areas of interest. Beach opposite hotel rather unkempt and uninteresting. But nice open air swimming pool on roof top. Very good breakfast spread - one of the better ones in a mid-range hotel. Friendly staffs, full sea view if take the Premier room (as per photo shown). Beach just across the main road, surrounding easily can find cafe and restaurants. Hotel daily tours price are reasonable for group booking. Gym could be better organized .. Stunning views of the beach from our hotel apartment. Probably the best for the price that we got it for. The location was also ideal, right next to the beach and bars. Free bike rentals as well. The breakfast was delicious and had a lot of different selection. Would stay here again when we visit Da Nang in the future. This hotel is pretentious. I paid a lot of money for a lackluster room with bad architecture. It felt like the building was slapped together. No chairs on balcony, cheap furniture, inconsistent room cleaning service, bad breakfast which I’m certain made me sick all combined, made my holiday simply bad, I have a small book I can write about how bad this hotel was but just trust me do not go here, they do not deserve any business, and need to “up” their quality starting with simply correcting their miss spellings littered around the hotel. The room we stayed in had a fantastic view, definitely the best we experienced in Vietnam. Great location across from the beach, as well. we were unlucky with the weather so could not use the nice roof top pool. staff is friendly, location convenient. Nybygging vegg i vegg med hotellet .Dette viser ikke på bilder. Utsikt fra balkongen rett inn i en byggeplass. Svært mye trafikkstøy fra gaten. Bra service .